JERUSALEM (CNS) — As Israeli students began their second week of classes Sept. 6, thousands of students and teachers from Christian schools converged in front of the Israeli prime minister’s office to protest government budget cuts to their schools. Chanting slogans, waving banners and signs, and pounding on metal barriers, high school students who have not yet started classes, took the front row in the demonstration. They called on Education Minister Naftali Bennett to provide funding for their schools on par with religious Jewish non-state schools, which receive full funding although they are not subject to the Ministry of Education inspection and many do not teach the core curriculum. There has been no progress in negotiations with the government, despite the church schools’ continuing protests, said Franciscan Father Abdel Masih Fahim, president of the committee of Catholic schools. “We are not here to beg for favors, but to demand our rights,” he said. Educators on the Christian schools committee have said they have withstood prodding by the Education Ministry for the schools to become part of Israel’s officially recognized school system. Such a move would mean losing the schools’ Christian identity, ethos and the ability to teach Christian values, say the educators. 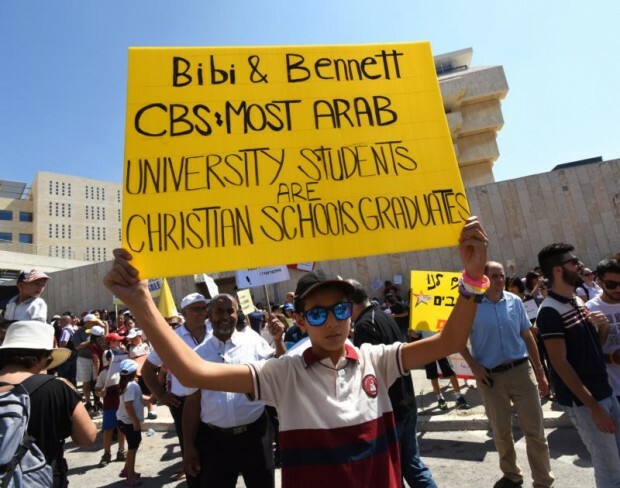 On Sept. 7, the students from the Arab state schools also joined the protest and stayed home from school in solidarity with the Christians schools. Demonstrations were planned in other cities, including Nazareth, and organizers said they would continue to protest until the funding is returned. The Ministry of Education denies charges of cutting the budget for Christian schools. Christian educators have warned that the funding discrimination by Israel’s Ministry of Education may force the closure of about 48 Christian schools, affecting some 33,000 pupils — roughly half Christian, half Muslim — who attend the institutions. The schools fall under the category of “recognized but unofficial” schools, like certain ultra-Orthodox religious Jewish schools, and are not part of the state school system, though they are accredited by the government and received 75 percent of the funding given to regular state schools. Tuition payments by parents make up the reminder of the costs. Over the past decade, the financing has been slashed to less than 30 percent of the school budget, according to Christian educators. This year, the Education Ministry tightened the restrictions further by stipulating that a limit of $3,528 per pupil per year is the maximum amount schools are allowed to charge parents at all Israeli schools. The budget cuts also affect the number of specialized workshops and seminars teachers can attend, which will also affect their ability to continue teaching at the highest standards, noted Sister Muna Totah, who teaches at St. Joseph School in the central Israeli city of Ramleh. “The struggle is not only about money, it is about being equal in this country. Everyone has the right to an education, and for the past three years the budget has been decreasing,” she said.